I have been frantically trying to get the garments done for the Fall Cast On. It would help if I wouldn't rip out my work so much. I broke my resolution of several years ago and didn't write up the pattern for the yoked sweater immediately. It is so much easier if you do it as soon as the garment is finished. I haven't had many lessons to review lately which has helped my time management. Don't be so considerate! Send in your lessons! The coat I am knitting has garter stitch short rows picked up on the sides. After several versions I finally decided the best approach would be to graft a seam from the bottom hem to the underarms. I don't enjoy grafting but when you want a "seamless" look it is the best way to go. I didn't want a bulky seam at the sides of the coat. Grafting garter stitch is really quite easy. As with anything, the process will be easier if you prepare. Second, position the needles properly. To do this, you have to have an understanding of stitch anatomy. On one size of the work, the stitches immediately below the needle are purl bumps. Compare this photo the photo above. 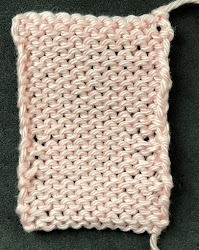 The stitches immediately below the needle are knit stitches. Go into the first stitch on Needle 2 knitwise. Drop it from the needle. Go into the second stitch purlwise. Are you done? No. Now you have to clean it up. I tend to do this every few stitches as I find it easier. The one thing you do NOT want to do is to pull the seaming thread tight. This is a real pain to clean up. Here is what your work might look like when you have finished the actual grafting. You can clearly see the oversized stitches. To fix this, you have to use a needle to shift the yarn from the right to the left so that it matches the tension of the rest of the piece. In the photo below the needle is in the grafted row. There is a row above that where the tension is uneven where excess yarn from a yarn tail has worked its way into the stitches to the left. In a real project, I would use the same technique to fix this as well. Cleaning up the Graft. In the example below the yarn has been pulled too tight. This requires more effort to fix. I will have salon this weekend as I am not going anywhere for the holiday. Stop by if you are in town from 1:30-3:20. I've finished all of the major knitting on the coat. I've worked the garter stitch, grafted it, picked up the fronts and worked the color. Since this is such a simple design I decided to try working the sleeves from the top down and picking up the stitches. I have to say, I REALLY like this method. I've always hated set in sleeves as they've never looked quite right to me. This solves all of those problems. I have to finish the sleeves and then graft the povisional hems. It is going to require seaming as well.